The consumer electronics and home appliance giant expects a group net loss of ¥420 billion for the year to March 2012, compared to a profit of ¥30 billion projected earlier due to re-organisation and restructuring costs. The first-half loss stemmed from declining sales, restructuring costs and the impact of the 11 March earthquake and tsunami, the company said. The weaker outlook came “due primarily to the sluggish overseas sales affected by ever-intensified price competition for digital products and the appreciation of the yen," the company said in a statement. The loss came against a net profit of ¥74.72 billion logged in the same period a year earlier. Osaka-based Panasonic booked an operating profit of ¥47.60 billion, down 71.8% from the first half of fiscal 2010, and sales of ¥4.01 trillion, down 8.3%. The company also revised down its full-year operating profit to ¥130 billion from ¥270 billion, while it now expects sales of ¥8.3 trillion compared to ¥8.7 trillion. 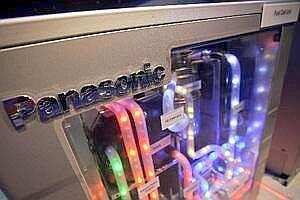 The revision also reflected an expected increase in restructuring costs mainly for it flat-panel TV and semiconductor businesses aimed at improving its financial situation, Panasonic said. The company is planning to sharply scale down its money-losing television business. Panasonic also unveiled a plan to transfer the headquarters of its procurement and logistics operations from Osaka to Singapore in a process starting in April 2012. “The move is part of the company’s globalization efforts in line with its midterm management plan," it said.